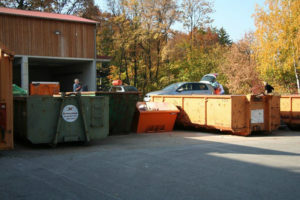 HOHENFELS, Germany — Germany is one of the most successful countries in recycling the trash for the good of the environment. A major part of the success is the proper sorting of garbage. But the whole subject of recycling can be an overwhelming task for any newcomer to the country. The good news is that there are some easy guidelines to follow. Let’s start with glass. Any kind of bottle or glass jar that is non-returnable and on which you did not pay a deposit or “Pfand”, belongs in the designated glass bins. This includes wine bottles, jam/preserve jars, oil bottles, juice bottles and even bath-salt bottles. Ceramics, china, mirrors and wine corks do not belong in the glass bins. Glass is sorted by color. There are different slots for depositing green, brown and clear glass. You will find these bins in every neighborhood. The only thing to take note of is the times when you should not recycle or you will have a couple of irritated neighbors on your hands. 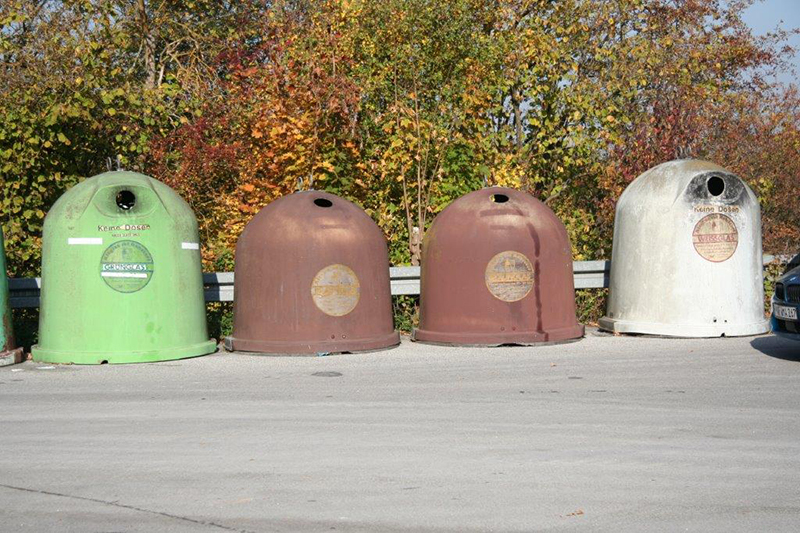 The other bins you will encounter are color coded; the color of the lid is key. Paper will go into the blue bin. All packaging made of paper and cardboard, newspapers, magazines, waste paper, paper bags, etc., belong in the blue bins. Tissues, however, do not belong here. Make sure to flatten boxes before putting them in the bin, and throw only the box and not the plastic wrappers in the bin. Plastic materials go into a yellow plastic bag (Gelber Sack). This bag is then placed outside for collection at regularly scheduled times. Cans, plastic, polystyrene, aluminum, tinplate and composite materials like beverage cartons made of a mixture of materials should be put in the yellow bags. Empty spray cans are also allowed in here. Do not put stuff inside each other, like the yogurt cup inside the baked beans tin. And lastly, spare a thought for the end process: this stuff gets sorted by hand. The waste management companies have kindly requested community members rinse the cans and cups before throwing them in the bags. The bags can be picked up in various places throughout a community – at a nearby kiosk, the Rathaus (local registration office), other stores or at the Self Help Store in Bldg. 742. Now you are left with the “other stuff” and biological waste. This includes kitchen scraps, peels, leftover food, coffee filters and tea bags. You are allowed to throw the bio stuff in your household waste bin, the black one. This includes ash, cigarette butts, old household objects like hairbrushes and frying pans, textiles and nylon stockings, nappies/diapers, tissues, other personal hygiene items, extremely dirty paper, etc. To ensure that the trash bin will be emptied by the city, do not overfill it with any waste. If you are still left with something you would like to throw away, you have the opportunity at certain announced times (information will be available at your local Rathaus) to place your stuff outside when Sperrmüll (miscellaneous items) will be gathered. This could include large furniture, building materials, etc. Don’t be alarmed by “collectors” driving around the neighborhood to inspect the thrown out stuff. Household hazardous waste, which includes fluorescent tubes, batteries and acids, cans of paint still containing paint, thinners, adhesives, disinfectants, insecticides, etc., has to be treated as hazardous. You need to bring your stuff to the Recyclinghof, which is an outlying area where you can bring your trash and Spermüll for them to dispose of in the proper manner. These areas are equipped with containers for the deposit of such things as furniture, batteries, electrical and electronic items, paper, plastic, cans, and glass, wood and garden waste. The personnel there can guide you to the proper bin. Now that you know where to put what, you need to know when to roll the bins out onto your street for collection. Your area will have a designated day on which garbage is collected. The only thing you need to find out is which garbage bin to put out. You can get a calendar with garbage collection details from your local registration office (Rathaus), or wait until your neighbors roll out their bins and check out the color of the week! For more information on how to sort your recyclables and proper disposal, contact your SORT Coordinator in Hohenfels, Bldg. 125, via DSN 466-4887, CIV 09472-83-4887, or visit home.army.mil/bavaria/index.php/trash.